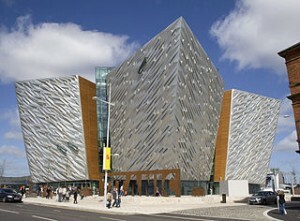 The newly opened Titanic Hotel in Belfast has been getting positive buzz. Conde Nast Traveler paid it a visit and it looks pretty spectacular. 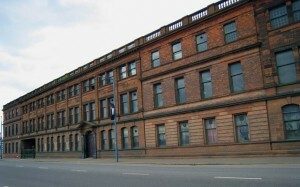 Formerly the drawing offices for Harland & Wolff, it is now a window to the past with a style for people of our time. The 119 room hotel features modern amenities while showing off the history of Belfast and Titanic. Clive Palmer’s plan to build Titanic II appears dead but a Chinese full size replica is on course to be built. According to China.org.cn a full size replica will be assembled at the end of this year. The replica will be the exact size of the original Titanic and will cost 1 billion yuan. Everything from door knobs to menus will look as if it was on the original Titanic (except some modern necessities as needed of course). The replica will also employ the use of a Titanic Sinking Simulator so that visitors will experience what it was like to be aboard when the ship was sinking. The replica will be permanently docked at a theme park in the Qi River in Daying County, Sichuan. It is scheduled to open in 2018. The Belfast headquarters–and former home of Titanic designer Thomas Andrews–of the International Football Association (IFA) will be put up for sale. 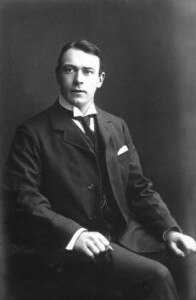 The IFA bought the house in 1960 from the Dixon family but it was the home where Andrews lived with his family before his tragic death when Titanic went down in 1912. The house was originally built in 1863 and while many of its features remain (the staircase that inspired the one on Titanic,stained glass windows, and fireplaces),an attachment to the property was built for the IFA. A plaque indicating that it was once the home of Thomas Andrews is on the outside. According to Belfast Telegraph, visitors have come to see the home and the stairs that inspired Andrews. The IFA is moving to a new location in February and the sale price was not listed in the article. An iconic Titanic mural painted in 2003 had become shabby looking due to weathering. 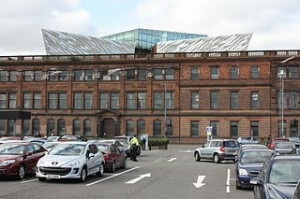 Located at the corner of Newtownards Road and Dee Street in Belfast, the mural had become a destination for bus and taxi tours. Painted in black and white, the mural honors the ship and the workers who built it. 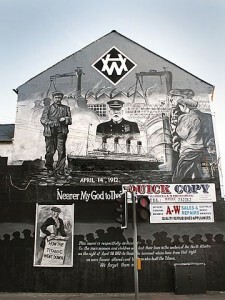 John Stewart, who was the artist who created the mural, was able to raise £3,000 ($4,595 USD) to help complete the restoration that took six weeks. According to a UTV news report, Titanic Belfast is a major economic boost to Belfast exceeding original targets. 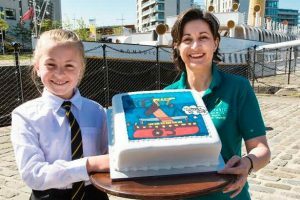 Between April 1, 2012 when Titanic Belfast began to March 2015 ,900 jobs have been created. 1.9 million people attended the galleries along with conferences and special exhibitions that drew people in as well. The figures also show that most visitors were from outside Northern Ireland (over 71%). Visitors spend money in lodging, food, sightseeing, and of course all kinds of extra purchases that put money into the economy. 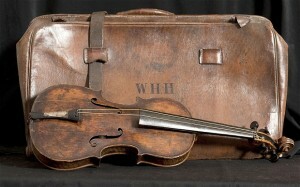 Titanic was a tragedy but celebrating its loss has proven to be a major boost for Belfast. 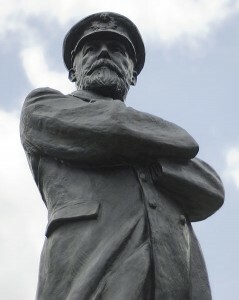 2.A statue to Titanic captain Edward J. Smith stands in Lichfield but how it came to be there is an interesting story. Locals did not pay for it but wealthy Americans and Britons. And its placement in Beacon Park was not without disagreement. Locals did not like a statue being paid for by wealthy Americans who sailed on a British ship. The statue was put up anyway but omitted any reference to Titanic until much later. Today of course it is a popular stop for tourists. Okay we get the point, you are not a fan of Belfast, Northern Ireland, these days. Perhaps you have a point about the tax money spent when, if they had played their cards right earlier, they could have used lots of private capital to achieve better results. Belfast and Titanic were not that close until fairly recently. For a lot of years it was remembered as the place it was built, the workers who had by hand put the ship together, and the sadness over the loss. Sure there were people that kept it alive but Belfast moved on and had bigger problems to deal with. 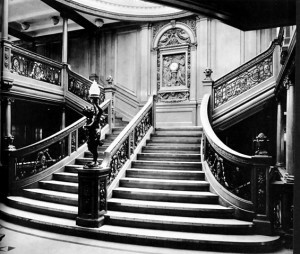 Then with the growing interest in Titanic and thanks to a very popular movie, the lights clicked about the opportunities Titanic offered them by becoming a major attraction for Titanic enthused travelers. And it worked from what the numbers reveal. What he said was tacky trying to create a hypothetical that if Titanic had never existed or never sunk, Belfast would be just a backwater in the United Kingdom. Most people are smart enough to avoid the foot-in-mouth disease. He may have said it just to generate the controversy he wanted. After all it set off a firestorm in Belfast as locals raced to microphones to criticize his comments and point out what a dolt he was for saying them. Some television personalities like to do this sort of thing to attract viewers, At any rate we here at Titanic News Channel award him our oft imitated and never duplicated Fractured Finger Award. We usually award this to dummies who use Titanic cliches but we make an exception in this case. Award not suitable for framing.